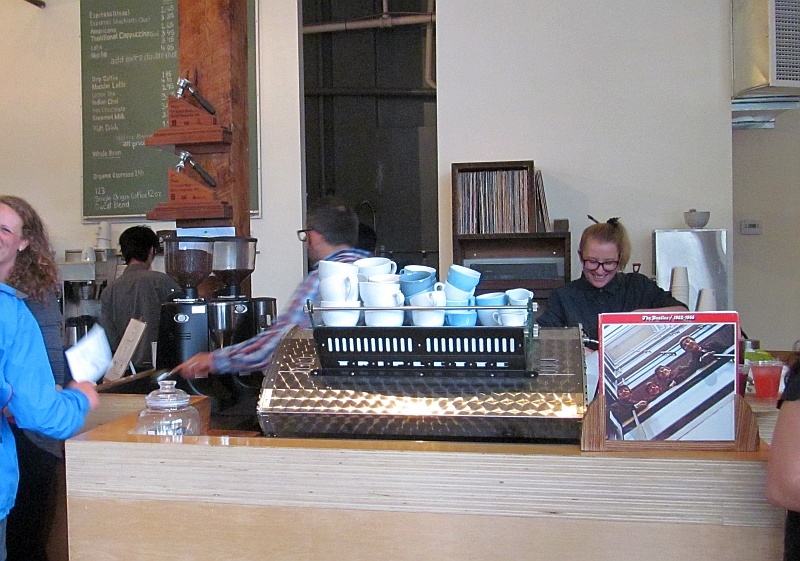 Commercial Drive is chock full of really interesting restaurants and cafes. Lots of different restaurants from different regions of the world. So this upcoming Tasting Plates should be a real treat for your taste buds. The details from Vancouver Foodster, your host for this event, are below. Enjoy. 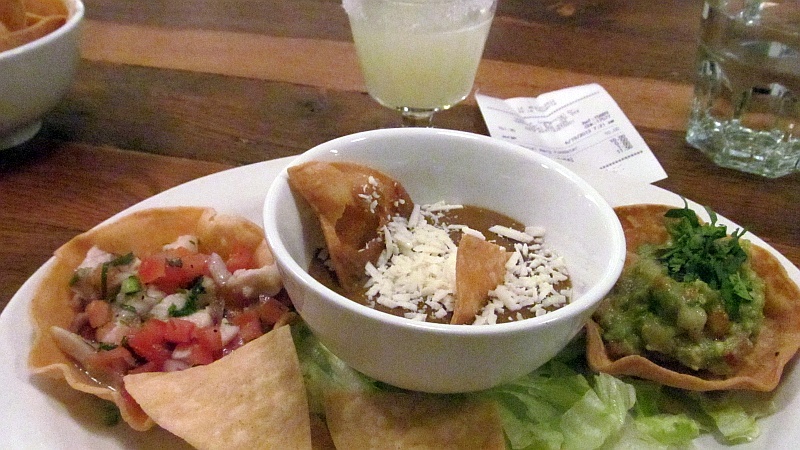 Tantalize your taste buds at several restaurants and establishments in the Commercial Drive neighborhood. 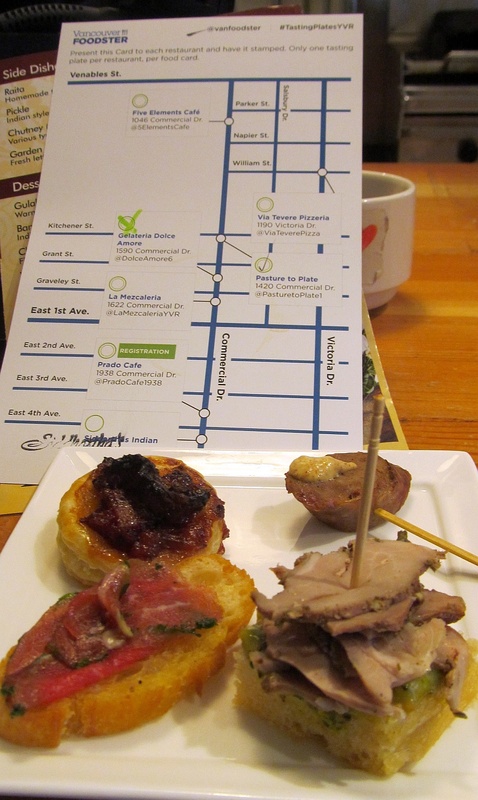 This tasting extravaganza goes from 6pm until 10pm and is presented by Vancouver Foodster. Each restaurant will be serving up Tasting Plates and Tasting Cups for guests to enjoy and you will have a chance to visit many different types of restaurants and a brewery throughout the event, meet some new food loving friends, meet the chefs, and learn about each of the participating restaurants. Registration: Federico’s Supper Club – this is where you will show us your printed or digital tickets and will pick up your Tasting Plates Cards and menus. Special Musical Guest: Lesismore will perform live at Federico’s Supper Club (which is also our registration spot) starting at 6:30pm. 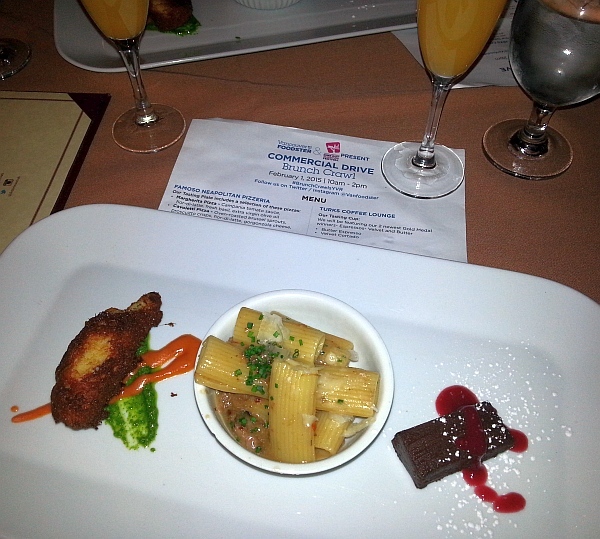 Federico’s Supper Club is one of the best Italian restaurants Vancouver has to offer. Discover a combination of authentic Italian cuisine and welcoming hospitality, served up in an old school atmosphere complete with live music and dancing five nights a week. Awarded Italy’s prestigious ‘Quality Seal Certification’, Opentable Diners’ Choice (2011-2015), and multiple Reader’s Choice Awards, guests are treated to fresh simple ingredients and dishes that are a reflection of old-world Italy with a contemporary twist. Located on The Drive in Vancouver’s ‘Little Italy’, there is something for everyone at Federico’s. A truly unique experience! Benvenuti a tutti! Regular Tickets $50 per person after August 10, 2015. If you are a fan of our Tasting Plates events you are going to want to hear about the 6 events that Vancouver Foodster is presenting during the upcoming Dine Out Festival that kicks off next month. The Dine Out Festival always offers diners a chance to try restaurants they may not have tried before which is often for dinner, this year Tourism Vancouver has added many more food related events to get people out exploring and tasting even more. 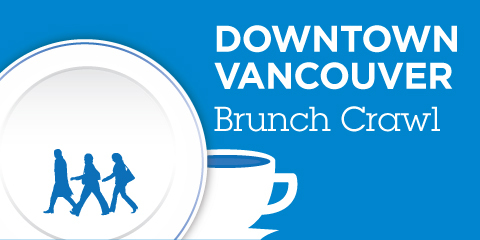 Earlier this year I produced two of the biggest Dine Out Van brunch crawls that Vancouver has ever seen, in 2015 I will be producing 6 Dine Out Brunch Crawls showcasing multiple restaurants in 6 different Vancouver neighborhoods. Visit 7+ restaurants through-out the Gastown area as you taste all sorts of dishes in this Brunch crawl. Enjoy the variety of dishes which may include juices, smoothies and coffees, to eggs bennys, pancakes, french toast, omelettes, pulled pork, hash browns, bacon, seafood, desserts and so much more. Venues: Participants include some of Gastown’s finest restaurants including: Brioche Eatery Café, The Blarney Stone, Milano Coffee, Salida 7, Jamaican Blue Cold Brew and more to be announced soon. Visit 7+ restaurants through-out Kitsilano as you taste all sorts of dishes in this Brunch crawl. Enjoy the variety of dishes which may include juices, smoothies and coffees, to eggs benny’s, pancakes, french toast, omelettes, pulled pork, hash browns, bacon, brunch pizza, desserts and so much more. Venues: Participants include some of Kitsilano’s finest restaurants including: Krokodile Pear, Novo Pizzeria, Darby’s Public House, Momento Coffee House, Rain or Shine Ice Cream and more to be announced soon. 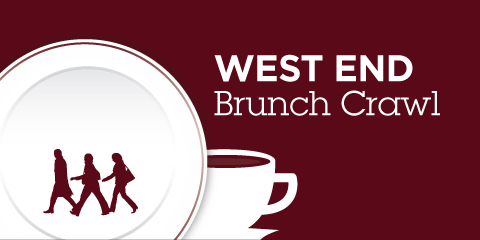 Visit 7+ restaurants through-out Mount Pleasant and area as you taste all sorts of dishes in this Brunch crawl. 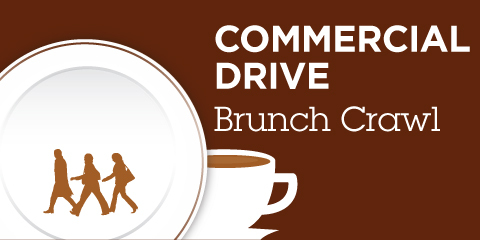 Enjoy the variety of dishes which may include juices, smoothies, coffees, and chai to eggs benny’s, pancakes, french toast, omelettes, pulled pork, hash browns, bacon, meats, desserts and so much more. Venues: Participants include some of Main Street’s finest restaurants including: Rosemary Rocksalt, Miura Waffles, Radicle Juice, Nirvana, East End Chai and more to be announced soon. Visit 7+ restaurants through-out downtown as you taste all sorts of dishes in this Brunch crawl. Enjoy the variety of dishes which may include juices, smoothies and coffees, to eggs benny’s, pancakes, french toast, omelettes, pulled pork, hash browns, bacon, baked goods, desserts and so much more. 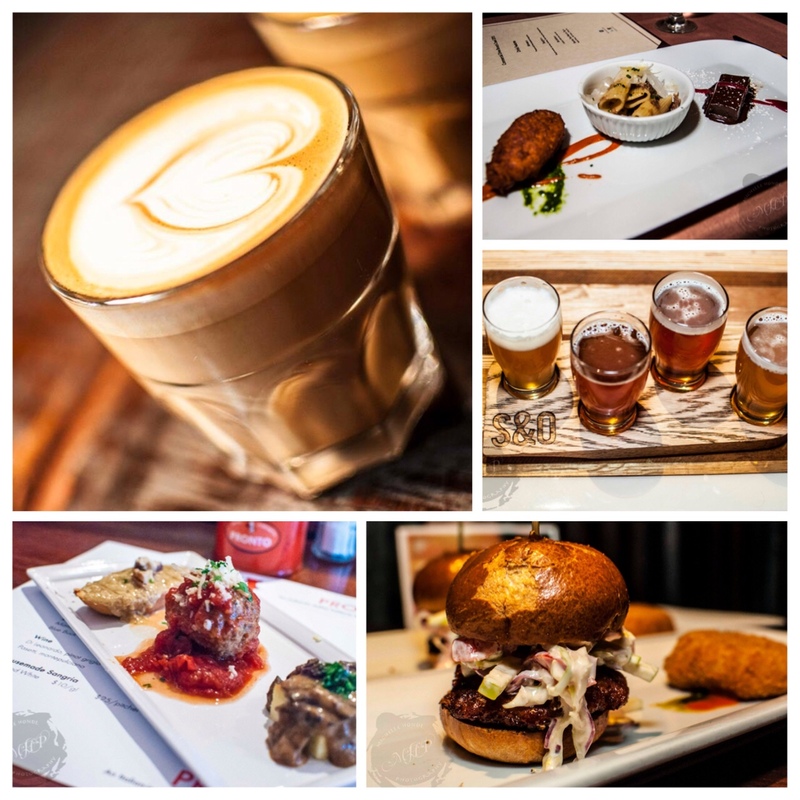 Venues: Participants include some of downtown Vancouver’s finest restaurants including: Frankie’s Italian Kitchen, Kingston Taphouse & Grille, The Copper Chimney, Small Victory Bread & Coffee, Bella Gelateria Yaletown, and more to be announced soon. A repeat event for 2015. Visit 7+ restaurants through-out the West End as you taste all sorts of dishes in this Brunch crawl. 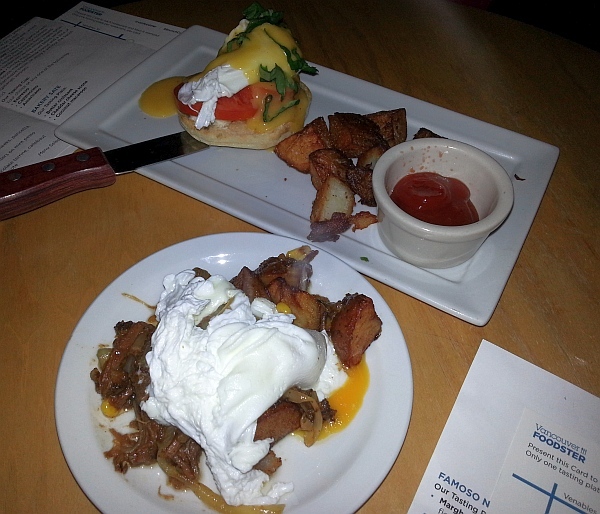 Enjoy the variety of dishes which may include juices, smoothies and coffees, to eggs benny’s, pancakes, french toast, omelettes, pulled pork, hash browns, bacon, seafood, desserts, mimosas and so much more. Venues: Participants include some of the Westend’s finest restaurants including: Papparoti, Morocco West, Just juice, Marquis Wine Cellars, De Dutch Pannekoek House and more to be announced soon. 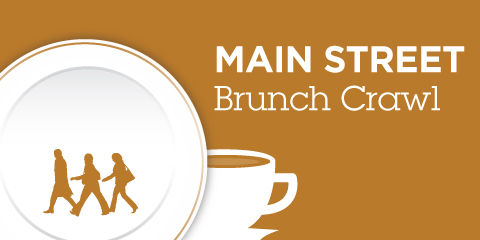 Visit 7+ restaurants through-out Commercial Drive and area as you taste all sorts of dishes in this Brunch crawl. Enjoy the variety of dishes which may include juices, smoothies coffees and beer, to eggs benny’s, pancakes, french toast, omelettes, hash browns, brunch pizza, desserts, and so much more. Venues: Participants include some of East Van’s finest restaurants including: Famoso Pizzeria, Federico’s Supper Club, Bakery Sate, Stateside Craft and more to be announced soon. Tasting Plates is always an interesting event. You get to visit around 6 restaurants, tasting a sample from their restaurant. 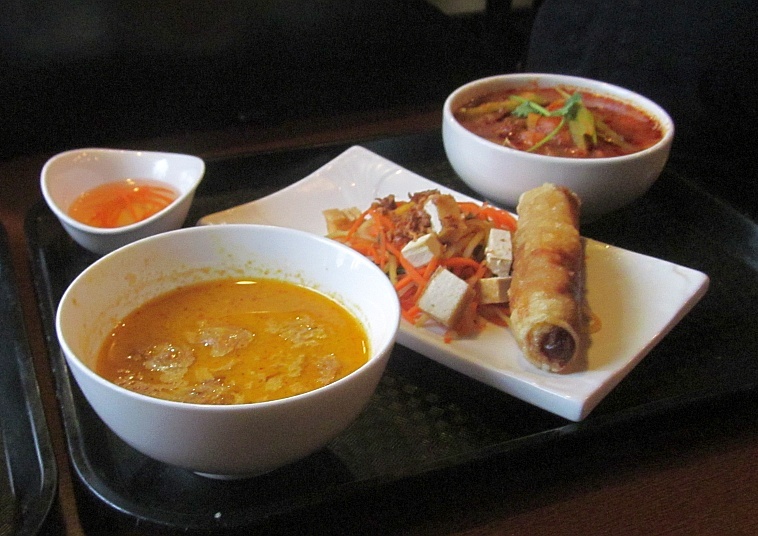 This Tasting Plates was held on Commercial Drive in East Vancouver and included 7 restaurants. Below are the restaurants with what they offered, along with my comments and pictures. 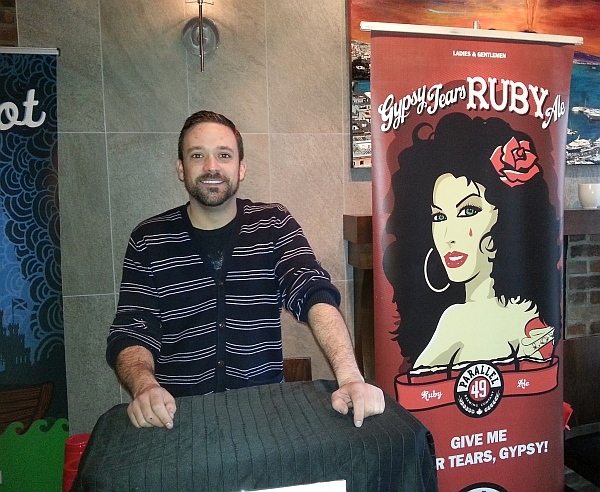 Thank you to Vancouver Foodster for putting on these events and inviting me. Enjoy! This was my last stop on the Tasting Plates scrum. 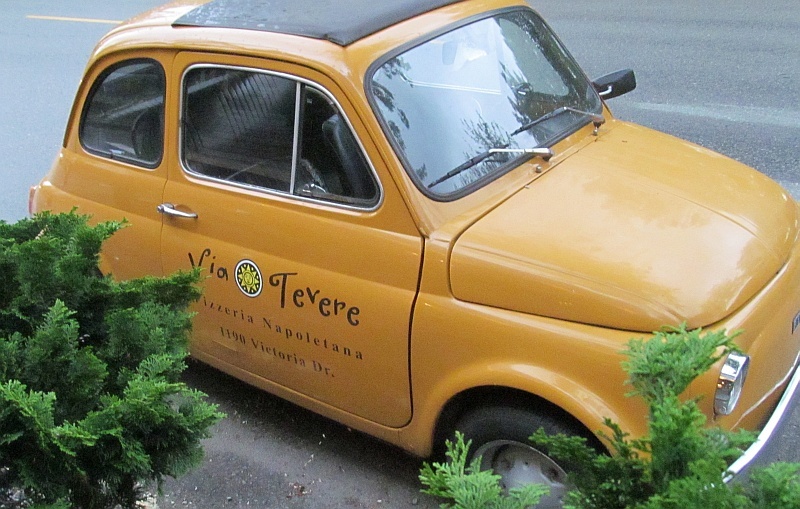 While Via Tevere is a restaurant, they also have a mobile food truck. 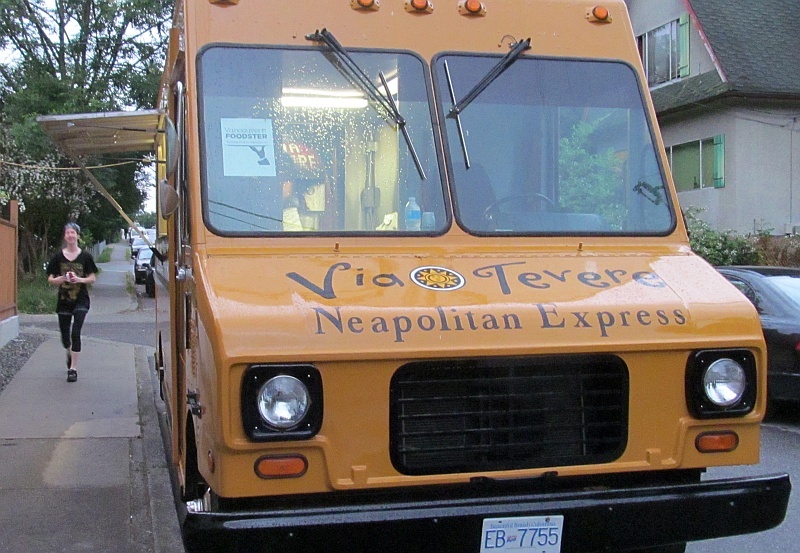 For us, the truck was parked beside the restaurant, cooking us Neapolitan style pizzas. The Margherita topped with San Marzano tomoato, fior di latte, and basil. 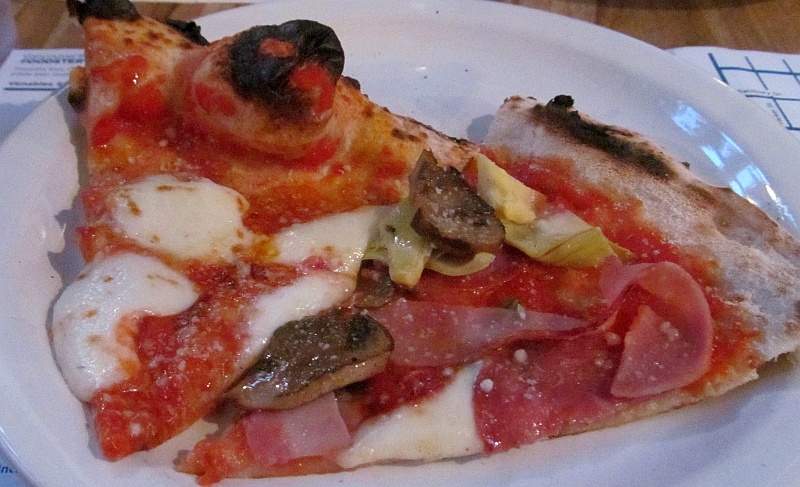 The Capricciosa topped with Prosciutto cotto, salami, artichoke, mushroom, and Nicoise olive. 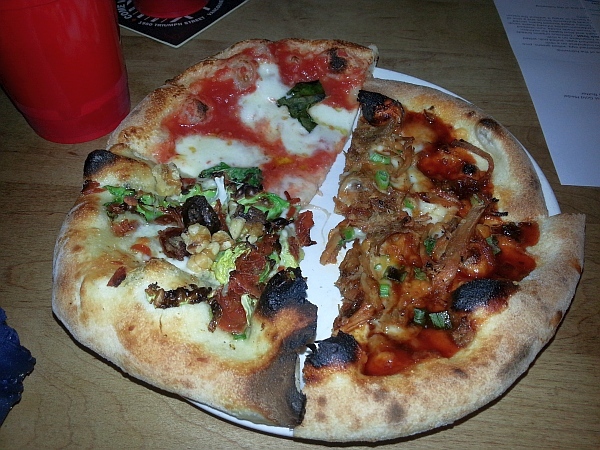 Nice crispy rim, the toppings not overly thick, making it easy to eat, and not dripping on your hands, or in your lap. Nice fresh flavours, which went down too quickly. Can I have another slice? I had the Menu B vegan option as the Green Papaya & Tofu Salad looked very interesting to try. I did enjoy the salad. Did you know that green papaya can be used as a vegetable? If not, try a green papaya salad. The Coconut curry was quite spicy, so if you are spice adverse, I’d suggest staying away from this dish. A variety of sausages on fork sticks with garlic aioli and mustards. 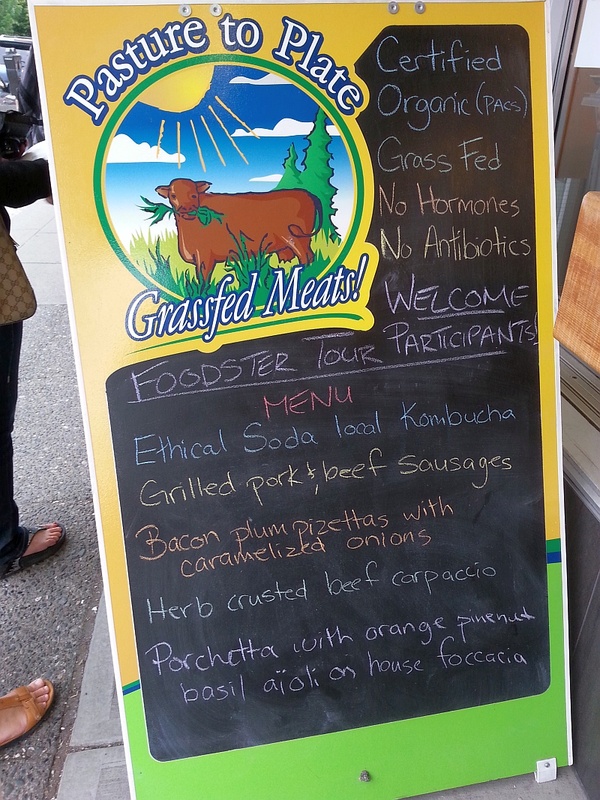 I do enjoy charcuterie, so I was eagerly anticipating trying these from Pasture to Plate. I did find out that they do farm biodynamically, which in my opinion, tries to enrich the soil, plants, and animals through non-synthetic chemical means, and works. (I’ve written a few articles in the past reviewing biodynamic wines, and these wines always seem very alive to me.) All the charcuterie was done very well and was very tasty, and I will come here again. This restaurant was super busy, with both regular customers and the Tasting Plates customers vying for the chef’s attention. Once in we had a sampling plate with ceviche, guacamole and refried beans, and chips to dip. The ceviche had bright flavours and was a good mix of fish and vegetables. I also really liked the smoky flavour in the refried beans. I will have to try this restaurant on a non-busy day. These two dishes come as a small ball (chicken) or a patty (Aloo Tikki). 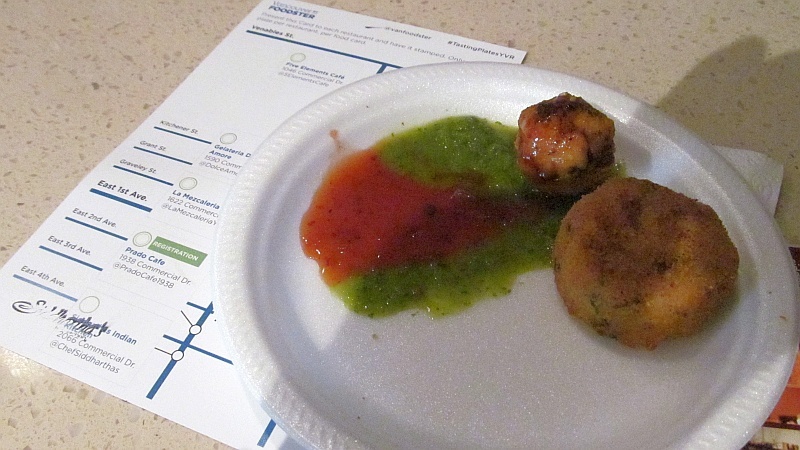 While both were very tasty, accompanied by a mint chutney, I liked the Aloo Tikki a bit more. This patty is made with ground potatoes, so is nice and soft, lightly spiced inside, with a crunchy crust. I have been told their Butter Chicken is a very good dish to try. 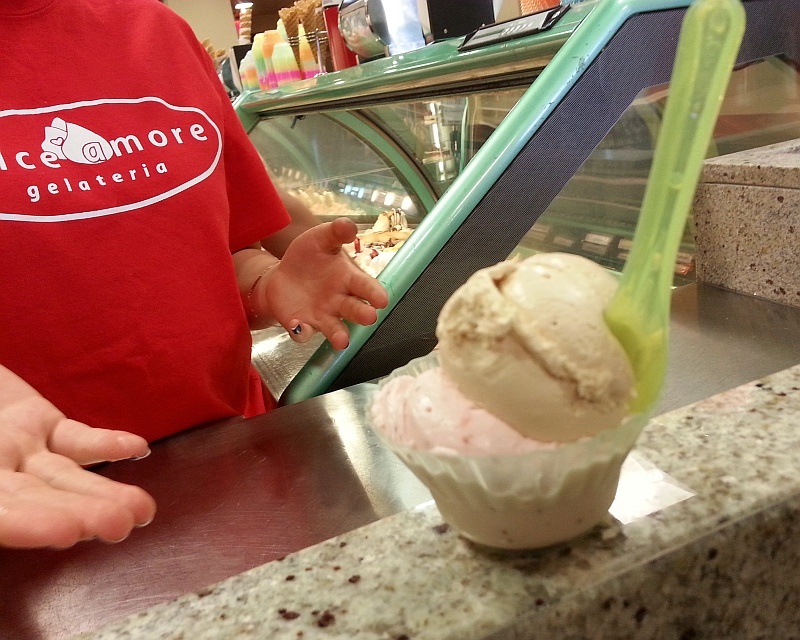 The surprise flavours from Gelateria Dolce Amore was hazelnut and strawberry. The hazelnut flavour was my favourite, with the very pronounced, fresh, nutty flavour of the hazelnuts coming through the gelato. It tasted like you were eating a handful of toasted hazelnuts. 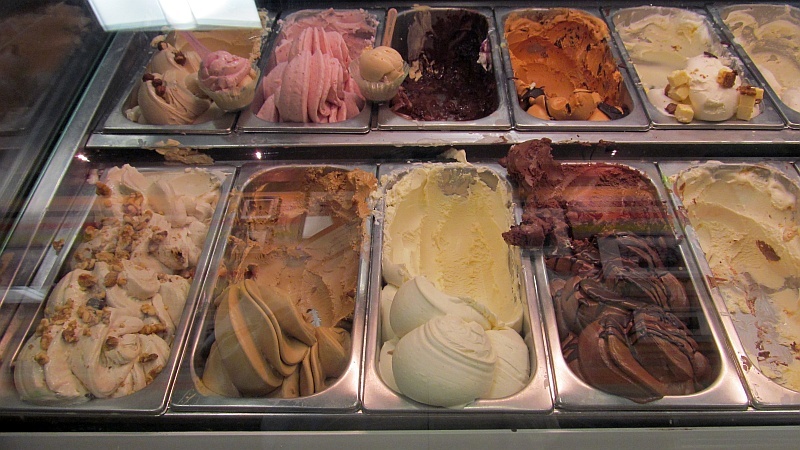 This Gelateria is a family run business. I spoke with one of the family members, who spoke so passionately about the quality of their ingredients and effort they put into making each gelato. I did ask if they have lavender flavour, which is my overall favourite (or mixed with lemon is my ultimate favourite flavour), and they did, and I tried it, and was delighted. Lavender may sound odd to some people, but get past the thought of it being floral, and try it. It is very refreshing. Just think of you sitting on a cafe in Nice, France, enjoying some gelato. Mini cookies “with no name”. 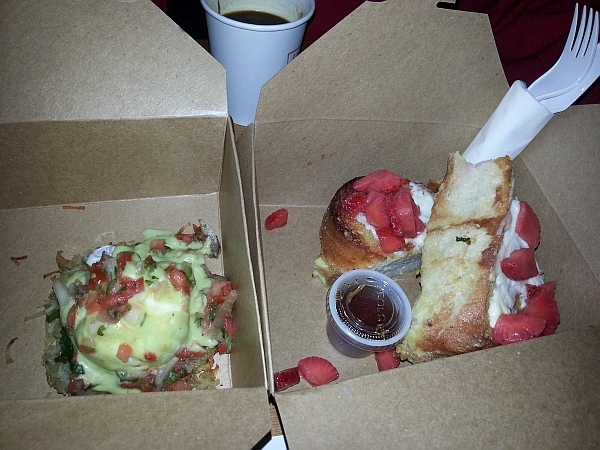 Our first stop was Prado Cafe. 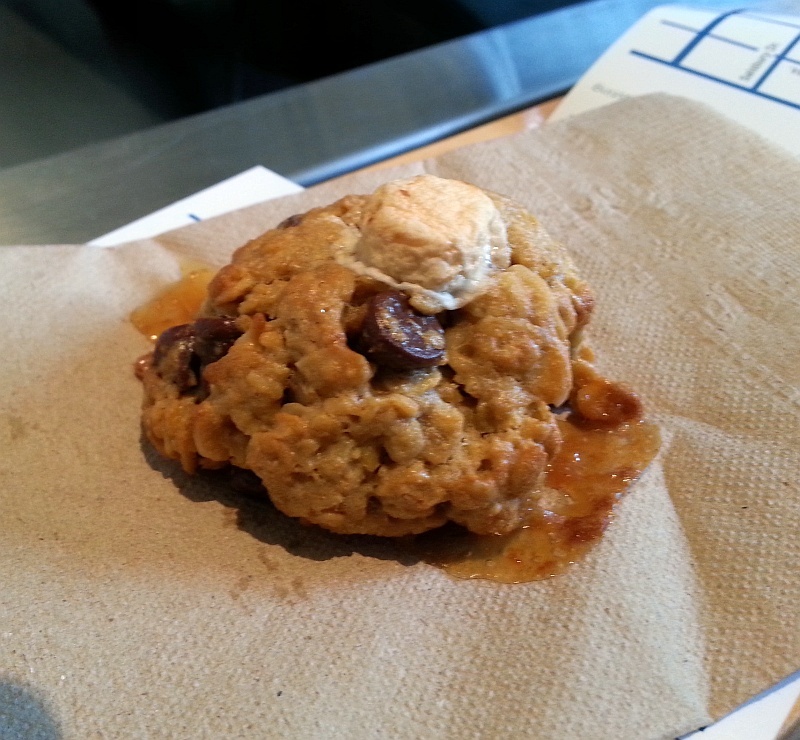 The cookie with no name, was fresh and hot from the oven, and looked to be made with granola/oak flakes, chocolate chips, and topped with a tiny marshmallow. It was very tasty. 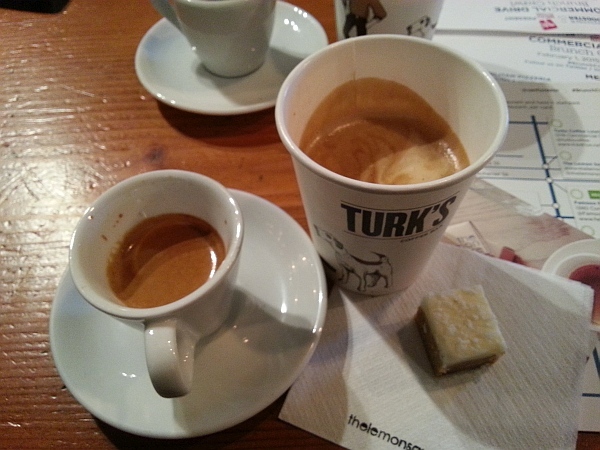 To sip with it, I had the macchiato, an espresso coffee, mixed with a small amount of milk. 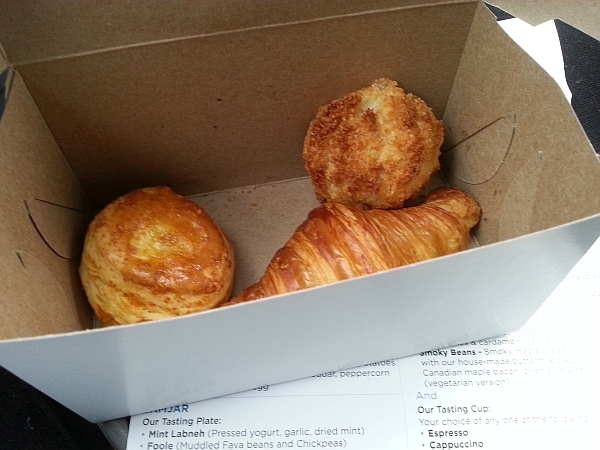 A good jolt to start of my Tasting Plates adventure.